Grade Lvl: T Author: Moyes, Rebecca A. Provides practical, hands-on strategies to teach social skills to children with high-functioning autism and Asperger Syndrome. It includes a detailed description of the social deficits of these children as they appear in the classroom - difficulties with such things as understanding idioms, taking turns in conversation, understanding and using tone of voice and body language - and ways to address them. 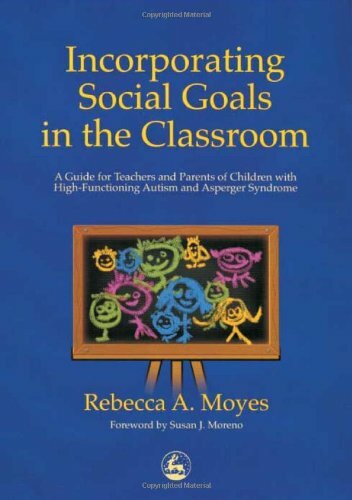 Instruction is included in the book to enhance the development of appropriate, measurable, and meaningful individualized education plans (IEPs) to incorporate social goals. Lesson plans are included to facilitate the ability to 'teach' these social goals.